Want to be recognized, respected and rewarded in your career? Want to grow your leadership effectiveness? Now is the time to take an honest look, access and advance your leadership skills. 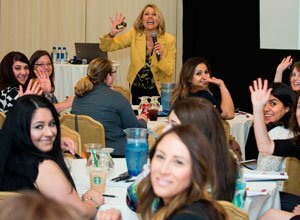 Join Colette as she delivers the latest research and strategies specific to women in leadership. You will gain the self-awareness and success-skills necessary to become an authentic, credible and confident leader — and laugh out loud along the way. Truths can be substituted based on your desired goals and program takeaways.